Overview: Welcome back to the continuing adventures of Peter Parker, the Spectacular Spider-Man (PPTSS). This book remains a companion book to Amazing Spider-Man, but focuses primarily on Peter Parker and his collegiate life. This volume breaks out into two separate sections – the first is written by Bill Mantlo, continuing the stories he started in Essential Peter Parker, the Spectacular Spider-Man Vol. 1. Mantlo wraps up the Carrion storyline, but not before bringing in the Lizard, the Iquana, and the Swarm. Following another appearance by Morbius, Mantlo concludes this run of PPTSS with a crossover with Fantastic Four, another title he was writing at the time. The second section picks up with issue #43, as Roger Stern takes over writing duties on the title. 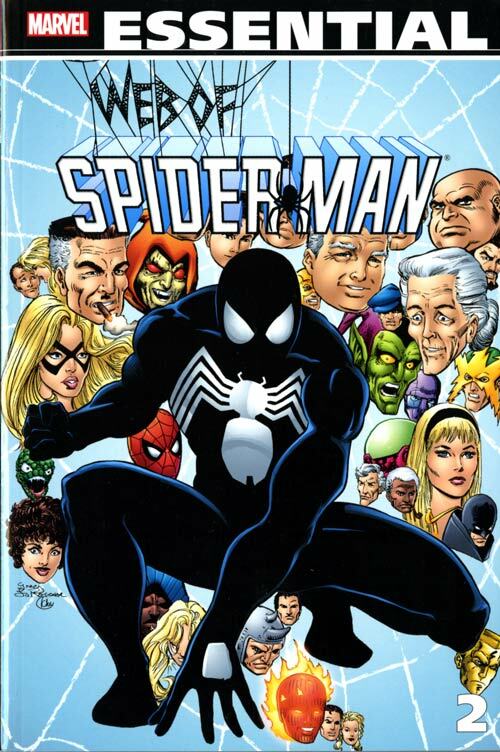 Stern brings back the Vulture and the White Tiger, and introduces two new characters into Peter Parker’s life – Nathan Lubensky would become a long-time tenant at Aunt May’s boarding house, and Roderick Kingsley, a background character in PPTSS, but will don the Hobgoblin costume when Stern moves over to Amazing Spider-Man. What makes this Essential? : I really want to give this a strong recommendation. I do. I like to think of PPTSS as the little book that could. But, the simple fact remains that this title plays second fiddle to every other book that Spider-Man appears in each month. You need to be a hard-core Spider-Man fan to want this volume. The stories are not bad, per se. Some of them are quite good. But each issue just reminds the reader that there are other stories you should be reading, which can be found in the Essential Spider-Man and Essential Marvel Team-Up books. Footnotes: Peter Parker, the Spectacular Spider-Man Annual #1 and Amazing Spider-Man Annual #13 were also reprinted in Essential Spider-Man 9. If you like this volume, try: the Spider-Man newspaper comic strip, which started in January of 1977. Originally done by Stan Lee and John Romita, Sr., this was a syndicated comic strip that told stand-alone stories not set in the continuity of the Marvel Universe. Other comic notables, such as Larry Lieber, Paul Ryan, Alex Saviuk, Joe Sinnott, and Roy Thomas, have helped out on the strip over the years. There have been a few collections of the early years of the newspaper strip. If your local newspaper does not carry the strip, it can still be read online at several websites. Overview: After watching his family slain by mobsters, war veteran Frank Castle starts a one-man war against crime by any means necessary, including murder, kidnapping, extortion, coercion, threats of violence, and torture. One of the Punisher’s early targets was Spider-Man, based on the fair and balanced reporting from the Daily Bugle. The Punisher tangles multiple times with Spidey before working out an uneasy alliance – they both realize they are working towards the same goals, but their individual methods go against each other’s principles. The Punisher’s vendetta also crosses paths along with way with Captain America and Daredevil. The Punisher, being of questionable mind and judgment, reasons that the majority of the criminals he needs to target are already in prison. He surrenders himself to authorities and ends up being sentenced to prison, much to his delight and the sheer panic of the other prisoners. What makes this Essential? : I will admit, I have a strong dislike of this character. Comics have always been an escape for me, into worlds with Kryptonian aliens or a teenager bitten by a radioactive spider. At the end of the day, I know characters like Superman and Spider-Man are not real. However, the Punisher can be real. We see too many instances in reality where someone becomes their own version of the Punisher, wanting to deliver judgment on those that did them wrong. By my thinking, heroes should bring the villains to justice, but not administer justice. So, trying my best to be objective and only think of Frank Castle as a truly fictional character, the Punisher does play a prominent role in the Marvel Universe. He is arguably the second most important or influential character created by Marvel in the 1970s, behind Wolverine. He’s been the subject of numerous comic series and multiple movies. A lot of the comics in this collection are hard to come by, so this is a great way to read about the first decade of the character. 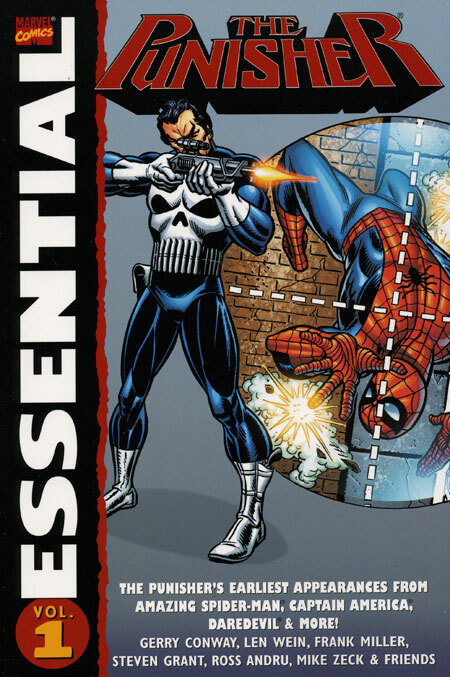 If you are a fan of the Punisher, you should own this Essential if you do not own the issues. 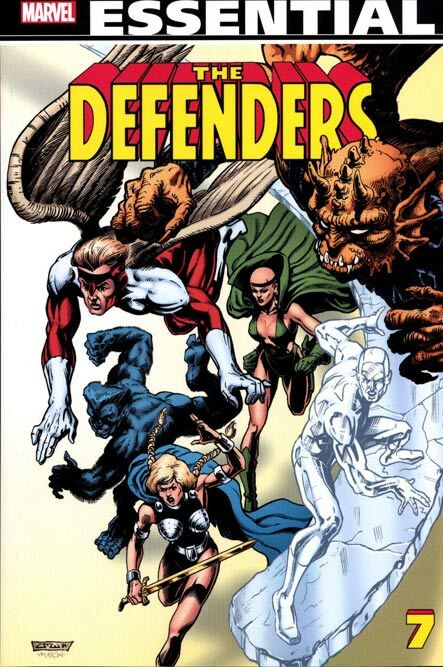 Footnotes: Early editions of this Essential misspelled Frank Miller’s name on the cover as “Millar”. Amazing Spider-Man #129, #134, and #135 were also reprinted in Essential Spider-Man Vol. 6. Giant-Size Spider-Man #4 was also reprinted in Essential Spider-Man Vol. 7. Amazing Spider-Man #161, #162, #174, and #175 were also reprinted in Essential Spider-Man Vol. 8. Amazing Spider-Man #201 and #202 were also reprinted in Essential Spider-Man Vol. 9. 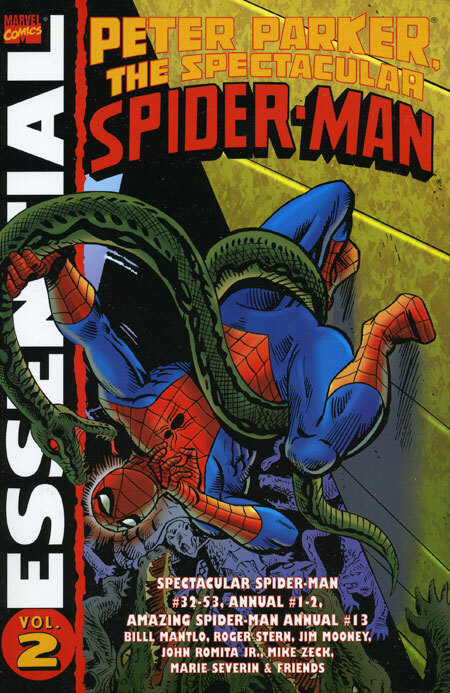 Amazing Spider-Man Annual #15 was also reprinted in Essential Spider-Man Vol. 10. Captain America #241 was also reprinted in Essential Captain America Vol. 7. Peter Parker, the Spectacular Spider-Man #81, #82, and #83 were also reprinted in Essential Peter Parker, the Spectacular Spider-Man Vol. 4. If you like this volume, try: the one Punisher comic I wholeheartedly endorse is The Punisher Meets Archie from 1994. In a joint venture between Marvel Comics and Archie Comics, the comic was released by both companies. Each company had a separate cover, but the inside contents were identical. John Buscema drew the Marvel characters, and Stan Goldberg drew the Archie characters. The Punisher is contracted by the government to bring in a drug lord by the name of Red, who is hiding in the small community of Riverdale. Castle infiltrates the school as a P.E. teacher and targets Archie Andrews who bears an uncanny resemblance to Red. The Punisher eventually finds his target, and takes him alive, much to his chagrin. 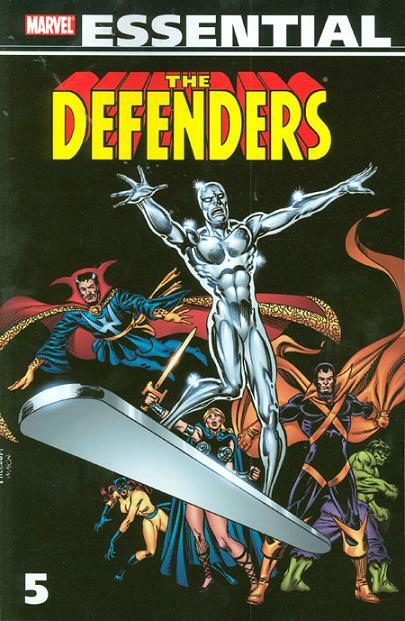 Sadly, this book has never been reprinted, so you will need to dive into some back issue bins to track down this title.